When Louis Creed leaves his busy job as a doctor in a Boston emergency room, and moves his family into a creepy wooden house on an expanse of remote woodland, he is hoping to spend some quality time with his wife Rachel, his young children Ellie and Gage, and their cherished family cat Church. While Louis’s new job as a doctor at a university campus gets off to a shaky start, Rachel and Ellie are disturbed by the sight of children in animal masks carrying their deceased pooch to lay it to rest in the pet cemetery that is uncomfortably close to the family home. Even closer is crusty neighbour Jud – a suitably ramshackle John Lithgow – who takes a shine to friendly eight year old Ellie and her beloved cat. Church is not long for this world, and Jud convinces Louis to bury the puss in the misty swamp beyond the pet cemetery. Before long, the swamp ejects our feline friend like some sort of demonic fur ball and a more ill tempered Church is soon back padding round the house, getting under everyone’s feet and liberally swiping its claws at the confused Creed children. But a grumpy zombie cat is soon the least of their problems. This second adaptation of Stephen King’s 1983 novel sets out its stall early. Shocks come thick and fast, and the film is devilishly fast paced. As the tale takes a grizzly turn in the second half, there are some truly frightening moments, and it is easily the most disturbing Stephen King adaptation in many a year. Purists may gripe at the liberties taken with the source material, but horror fans will find lots to enjoy in a movie that is unapologetically frightening and entertaining. Directors Kevin Kolsch and Dennis Widmyer are unrelenting in their pursuit of pure horror, and the script is refreshingly lean, dispensing with much of the symbolism and satire that has characterised recent horror hits. Jason Clarke is always watchable, and his performance renders the somewhat speedy transformation of Louis from practical and earnest university doctor to Dr Frankenstein palatable. 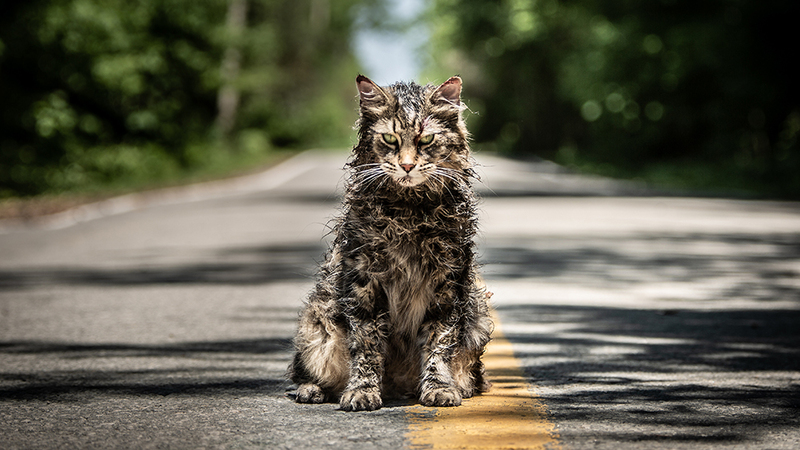 Pet Semetary is surprisingly sincere and resists the urge found in many contemporary horrors to wink at the audience, or hammer home some lofty subtext. With the second instalment of Stephen King’s It due on our shores later this year, fans of a good scare could do a lot worse than spend their Friday night in the company of what is bound to be one of the most successful genre movies of the year. Viewers who love nothing more than to cuddle their children and cats should probably stay away!